Threads are Mettler Polysheen 0546, 0822, 6133. Along the top of the card I have used a gorgeous new die by Marianne Design CR1267. the leaves are from the Flourish leaf strip. "Just for You" stamp is from Lili of the Valley. Tim Holtz distress ink "wild honey" adds a perfect colour throughout the card. Pearls, butterfly's and hobbdots have also been added from my stash. It was a real adventure creating this card and one that I enjoyed. I hope that you also like it. This week is was Supernan Sue's birthday and this is the card that I created for her special day. The patterns is a681 and is available from Ann's Paper Art webshop. 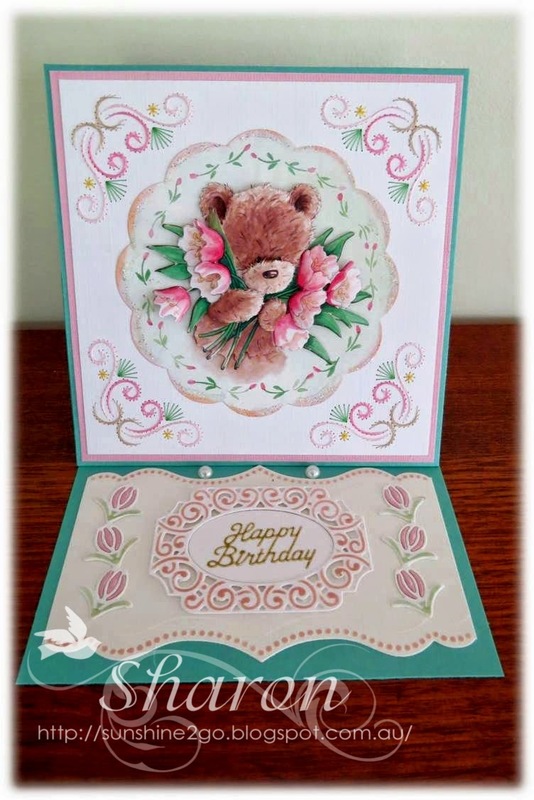 The cute image decoupage is Popcorn the Bear and is also available from Ann's Paper Art webshop I diecut around the image with Spellbinder S4-249. 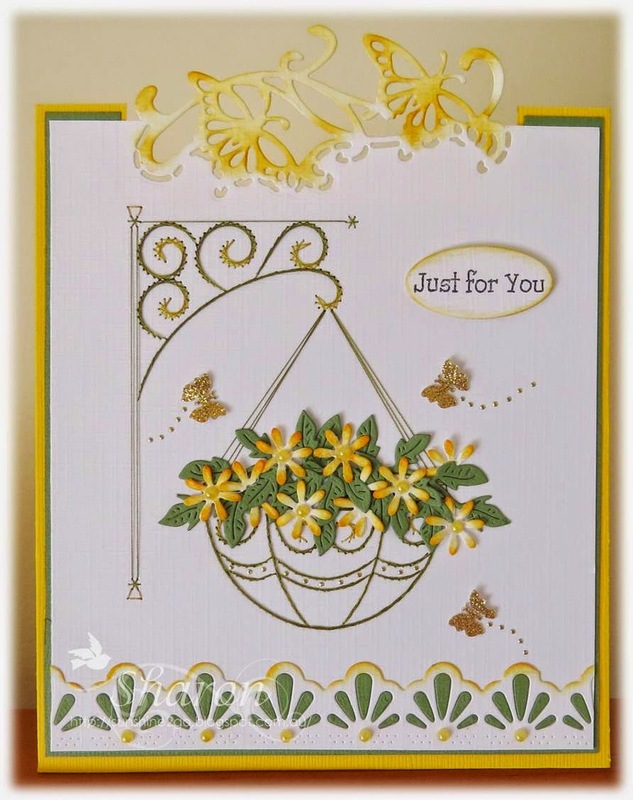 I diecut the base of the card with Marianne Design creatables LRO300. Happy Birthday sits perfectly in the Marianne Creatables LR0309. Flowers along the side are Lea'bilities 45.85558 -corner flowers. Varies Tim Holtz distress stamps, glamour dust and pearls add the finishing touches. I enjoyed creating this birthday card for my friend on the other side of the world. Ann's Paper Art the number is a609, this is such a beautiful pattern and can be used so many different ways. Threads are Mettler Polysheen 0453, 2521. I used the Tim Hotz flower die 657824 as it has a beautiful collection of flowers on the one template. wild honey and aged mahogany. 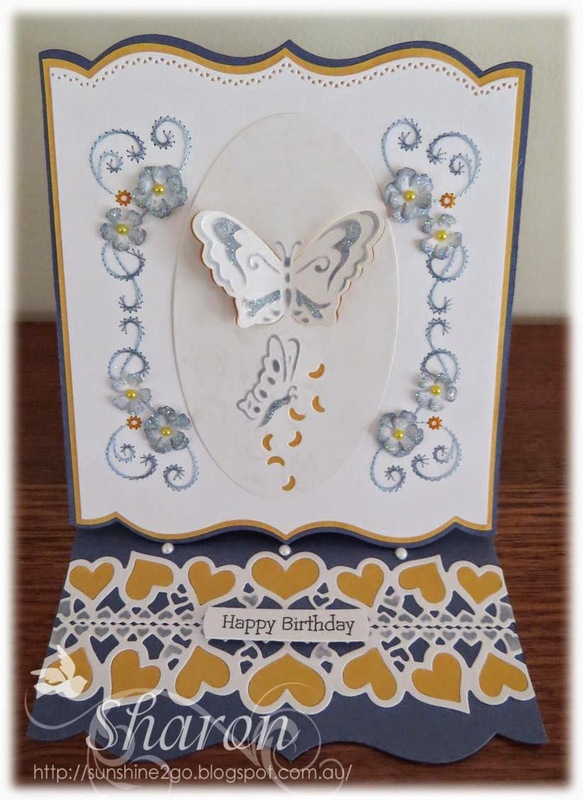 Vivienne Butterfly die is from Memory Box. Joy! Line & Lene 1201/0047 makes a beautiful edge along the base of the easel card. The stamp and die are from Whimsy Stamps "Notables 1"
I had a lot of fun creating this card and I hope that you all like it. Today is our daughter's 35th birthday, boy where have all the years gone!! it only seemed like yesterday that she was a teenager. Another beautiful pattern by Ann's Paper Art a318, I adore this pattern and seem to use it quite a bit as it is very versatile. Threads are Mettle Polysheen 0824, 3761,8853. The main card is created using Spellbinder Boardabilities S5-181. Flower die is Tim Hotz 657824 there are a lot of flowers on this die and so very useful. 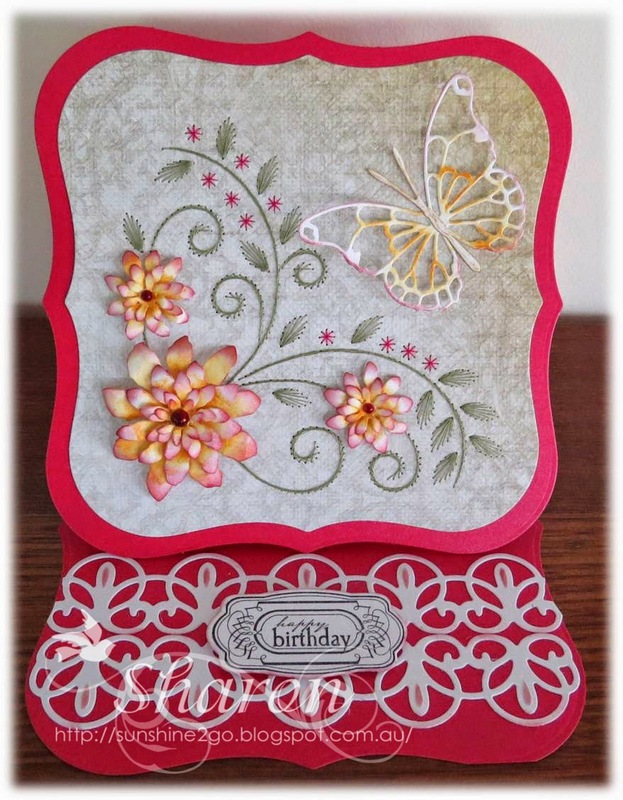 I coloured the flowers and butterfly with Tim Holtz distress ink "weathered wood". I added Deco Art Glamour dust around the edge of the flowers and a yellow pearl in the centre. I enjoyed creating this very special birthday card for our daughter and I hope that you also like it.